Title: 'America Sive Novus Orbis Respectu Europaeorum Inferior Globi Terrestris Pars', Publication: Americae Pars Sexta sive Historiae ab Hieronymo Bezono. This beautifully engraved map of the Americas is one of the most decorative of late 16th century maps and was to become a major influence in the elaborate style of the Dutch period. The map is largely derived from the Plancius world map of 1594 with an improved form of the Solomon Islands. Newfoundland is depicted as a single island based on the information of Cornelis Claesz and Lasso. 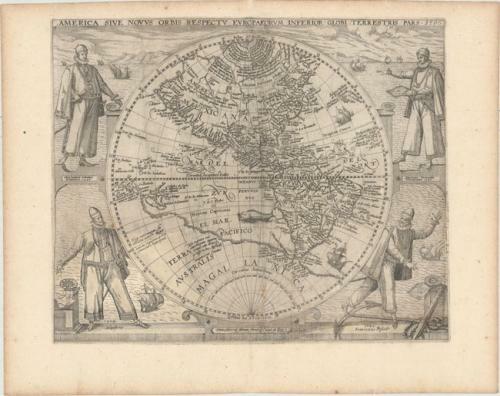 Most significantly, this is the first Western Hemisphere map to incorporate the White - Le Moyne cartography in Virginia. The massive southern continent is named Magellanica. The map is finely decorated with four important explorers flanking the map - Christopher Columbus, Amerigo Vespucci, Ferdinand Magellan and Francisco Pizarro - and a seascape background filled with sailing ships. Condition Description: A dark impression with light soiling, several extraneous creases, and a few minor stains adjacent to the centerfold. A 4.5 x 5" section at bottom left as well as a thin strip along the border at bottom right have been expertly reproduced in facsimile on old paper. Trimmed to neatlines and remargined with old paper.